No matter how excited you are to go away on a trip, packing can actually be stressful. Deciding what pants, skirts, dresses, shoes (flats, heels and sneakers? ), jackets, tops, can be stressful enough, especially if you have to plan each day out. 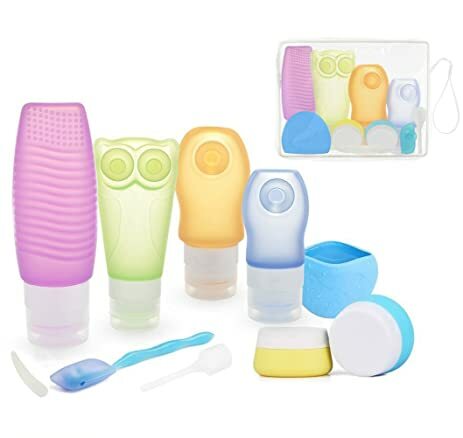 But in addition, there are all your toiletries…products you need every day, regardless of how short a time you are going away. How do you pack your moisturizer, primer, body lotion, mascara, an array of lipsticks (of course!) 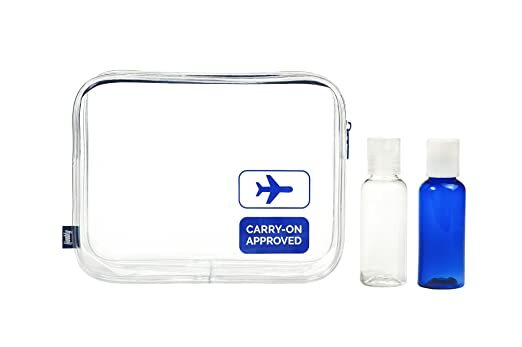 and all the other sundries you need…in a way you can get to them easily AND to comply with TSA regulations for flight travel. If you’re not checking, it gets tricky to bring everything you need on board! You also want to pack carefully because we’ve all have had the disastrous mess of an exploded bottle of foundation leaking in our bag. For toiletries, the flight reminder is simple – the 3-1-1 rule. You can carry on a clear 1-quart resealable plastic bag filled with liquids and gels, each in a container of 3 ounces or less. Anything that doesn’t fit into that clear bag needs to be checked. How can you prevent future travel disasters from make-up exploding or shattering and get to your beauty essentials toiletries easily? Here’s a guide! While you can get 1 quart resealable containers at the supermarket, you can also buy inexpensive ones online that give you a teeny bit more room, although still TSA compliant. They’re sturdier too. Try eBags Zipper Clear Quart Pouch. That 1-quart bag that can come on the plane with you isn’t that big. So only bring on your essentials, concealer, mascara, moisturizer, lip balm, gloss, contact lens solution and the convenient travel size of REJUVENIQE® Oil Intensive, perfect to put on your hair and face for a post-flight fresh-up. So you’ve got the most important things with you and heaven forbid, your bag gets lost, you’ve got your go to items with you in the worst case scenario. While you can buy a world’s worth of miniature versions of toiletries at a local drugstore, like toothpaste and contact lens solution, it’s a lot easier to fill up small containers with your prized possessions, like foundation, make-up remover, and your favorite shampoo and conditioner like the wonderfully hydrating Renew Shampoo and Restore Leave-In Conditioner. The best part is that they’re leakproof so no dipping your hand in a gooey bag! If you don’t have travel size versions of your favorite MONAT products, here’s how you can still take them with you on your next vacay. Try this set from eagle creek or this great collection from Flight 001. Don’t forget to write on them with a permanent marker so you know what is in which. You may have some small items that can be easily wrapped, like a glass bottle of foundation or a perfume bottle. Pack it inside a pair of socks. This will keep it protected. While a tightly screwed cap should offer protection, sometimes, just sometimes, that’s not enough. For any bottle you’re just not sure about, duct tape the pop-top opening or lid and then wrap it in plastic cling wrap. You can’t get any more secure than this and it’ll pay off if you’re bringing a self-tanner. Trust us on this one. Keep like items together. Don’t pack your toothpaste next to your foundation or your mascara next to your shampoo. This will help when you’re dashing to get ready and get out the door for your next fun adventure. Usually, cosmetics are the last thing we put in our bags. But be smart and put those resealed bags of containers in the middle of your suitcase, surrounded by tees and underwear to cushion them. This really helps to prevent any breakage. Just don’t wrap them in an irreplaceable silk blouse…just in case! Keep these hacks in mind and you’re ready to fly with a clear mind! ← Spring Break Do A Number To Your Hair? Fix It Now!